Alexander Richter was born in Jena, Germany and began making his first steps as a musician at the age of 9, in what was then the Fanfare Orchester Carl Zeiss, Jena. While he had modest success with the recorder (a wooden flute), he enjoyed greater progress after switching to the trumpet. He won numerous prizes at festivals and contests for young musicians and consequently decided to pursue a music degree from the Hochschule für Musik und Theater “Felix Mendelssohn Bartholdy” in Leipzig, Germany, where he studied with Peter Michael Krämer and Tobias Willner (Staatskapelle Dresden). For his performance exams, he studied with Erich Rinner (Münchener Philharmoniker) at the Tiroler Landeskonservatorium Innsbruck (Austria) and later as a private student of Bo Nilsson in Malmö Sweden. During this time, he performed as a member of the Erasmus Brass Ensemble, solo trumpet of the Schleswig Holstein Festival Orchestra, with the Internationalen Jugend Orchesterakademie Bayreuth and the European Philharmonic Orchestera. Throughout his studies, he maintained contact with the Fanfare Orchester Carl Zeiss, which eventually became the Brass Band BlechKLANG, working with them to ensure continued progress of the performers and the group. In 2005, in addition to his position as the solo trumpet of the Philharmonishces Orchester Plauen-Zwickau, he assumed direction of the Brass Band BlechKLANG, and has been largely responsible for their progress. In 2008, he led the band to first place, 3rd Division at the first German Brass Band Championships and into the 2nd division. Alexander is very active and popular as a teacher, lecturer and guest conductor. 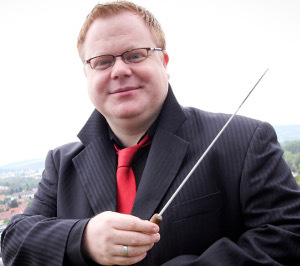 He has worked extensively with many different symphonic and brass bands, but his main focus remains the Orchesterschule KLANGwelt, a music school in Jena for youth and interested adults that he helped establish in association with the Brass Band BlechKLANG. Wherever he may find himself teaching, however, he always works hard to equip the rising generation with the tools necessary for continued growth as musicians. In his position as Vice-President and Chair of the newly established German Brass Band Association, Alexander has worked to establish functional and stable programs to continue the advancement of the brass band scene in Germany.